Parking signs, parking tickets, pah! 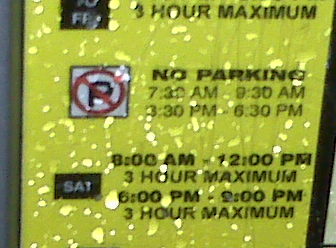 Parking signs drive me crazy. And, admittedly, as they say on Twitter, this is a #firstworldproblem. Still, I’m going to rant for a minute. I’m a successful graduate of my high school, a college and two universities, and yet I gather with groups of my neighbours to study the parking signs in our neighbourhood, deciding when we should be moving our cars to the other side of the street or whether dinner guests really do have to leave within an hour. When I venture out into other neighbourhoods, where I may not find such friendly guidance, I run the risk of tickets, solo. Tonight, on a rainy night, I rushed down to Union Station to pick up my sister. I cooed to her that I had found a place to park, where at this late hour, I didn’t even have to pay the meter. We returned to a ticket – the area is a No Standing zone between 6 p.m. and midnight. 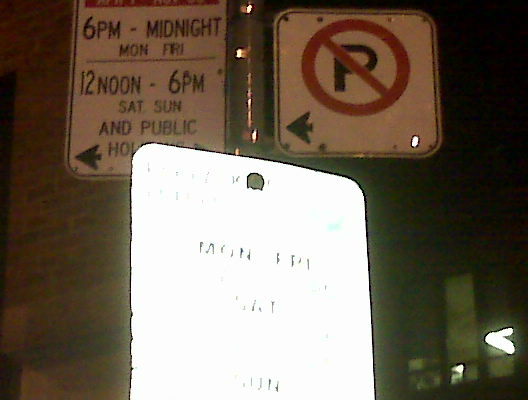 That sign was obscured behind the larger sign commanding payment at the meter during the day. The row of us all had tickets. A quick Google search showed others had been hit the same way (and taken better pictures). Another fishing pond for tickets. Life in the big city, no? My area in front of my workplace is particularly bad. There a parking meter sits under a set of signs that, if studied, reveal that, anywhere to the west of the meter, the exact direction in which it faces, it is a No Stopping zone every week day. However you have to read all four signs to learn that. Colleagues have stood there and debated with people as to whether park was allowed there. Close to $400 later, parking ticket in hand, they believe. 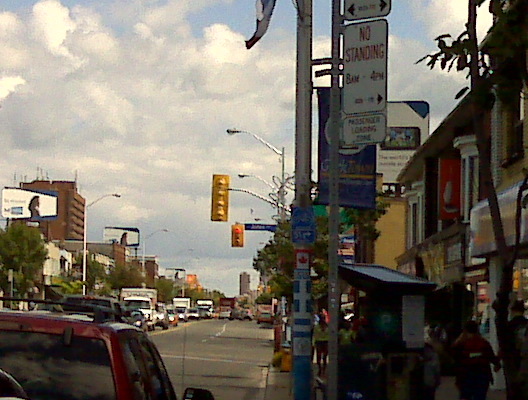 If you are driving your own vehicle or a rental around Toronto, be very careful where you park. We found the parking signs on the streets to be a bit confusing, so opted to park in garages, which was much more costly. I have full respect of the law. I just want/need to be able to understand it, if I am going to obey it.